Wild mint is easy to recognize once you know what you are looking for. Its most distinctive, obvious characteristic is its square stem. Pinch the stem, and roll it in your fingers. You’ll feel the square shape, and you will also release the minty fragrance. Mint grows easily in most of the United States and throughout Canada. The leaves of the plant are serrated and textured, and average a few inches long. Flowers (usually white, violet or pink) will appear in July or August. It prefers moist ground and some shade, and might be found near streams, and in meadows or pastures. It can grow up to two feet tall. Mint contains menthol, which can be used as an antibacterial agent. Externally, it can relieve pain, cool the skin, and increase blood flow to the area where it is applied. Internally, it is used to combat colic and flatulence, ease stomach pains, and stimulate the liver and gall bladder. Of course, the easiest way to enjoy mint is to smell it! Mint tea is also delightful, and good hot or iced. For tea, you can chop up both the leaves and the stems. Use about a half cup of mint to 4 cups of boiling water. Don’t boil the mint, but instead pour boiling water over it and let steep for at least 5 minutes. To use fresh for cooking, pick the leaves off of the hard stems, rinse in water, pat dry, and chop or crush. The flavor can be diminished by too much heat though, so if you are using it as a spice, add it near the end of cooking your dish. You might enjoy sprinkling mint leaves into a green salad for a fresh taste. Mint dries well for later use. I keep a wicker basket on my kitchen counter, and just toss the leaves in it. Once a day, I stir it with my fingers. When it is completely crunchy-dry, it can be transferred to a glass jar, but be sure it is very dry before sealing it in any container. You can use dried mint for tea, or crumble it for cooking. If you would like to try to grow your own mint patch, cut a mint stem about 6″ long and root it in water. After your plant is well established, be sure to cut it often and use it! This will help it stay full and vibrant. Remember that mint is an invasive plant, and once you’ve planted it, you most likely will have it coming up in a wider area as the roots spread and develop. If you have a large barrel or tub planter, this may be a good home for your mint. I also enjoy catnip, a member of the mint family. The taste of catnip tea is a little stronger than other mint teas, and can be an acquired taste. A century ago, Ojibwe women relied on catnip tea to treat fevers. I find it helps with mild pains, such as a headache or back pains. Amazingly enough, the local barn cats that roam through our yard don’t even bother with my catnip patch! 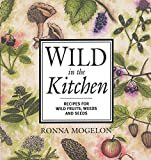 A great addition to the kitchen of any forager. Clearly written and beautifully illustrated. You’ll find plenty of recipes to help you turn your foraging finds into tasty meals for your family.